Federal officials are exploring every available option to get the Trans Mountain pipeline built, but Ottawa faces a wall of opposition including from the B.C. government, municipalities, the green lobby, and a number of Indigenous groups—the majority, in fact. But many First Nations leaders are in favour of Kinder Morgan Canada’s $7.4 billion project and are frustrated by the perception that all First Nations are in line with those who oppose it. Currently, 43 Indigenous groups have signed mutual benefit agreements with Kinder Morgan—10 in Alberta and 33 in B.C.—and several of those have gone public recently stating they support the project and are fed up that those who are against it get all the media coverage. “We just wanted to make sure that, given what was out there in the public eye, the media knew and could report that the Simpcw First Nation had an agreement with Kinder Morgan. It’s pretty simple,” Chief Nathan Matthew said in an interview. The Simpcw nation, formally known as the North Thompson Indian band, may have the most on the line among stakeholders. Matthew pointed out that roughly one-third of the pipeline would traverse through their traditional territories, which stretch from Jasper to Clearwater, B.C. The Trans Mountain expansion project would triple capacity and get Alberta bitumen to international markets by twinning the existing pipeline—currently North America’s only pipeline with access to the West Coast—running from Edmonton, Alberta, to Burnaby, B.C. 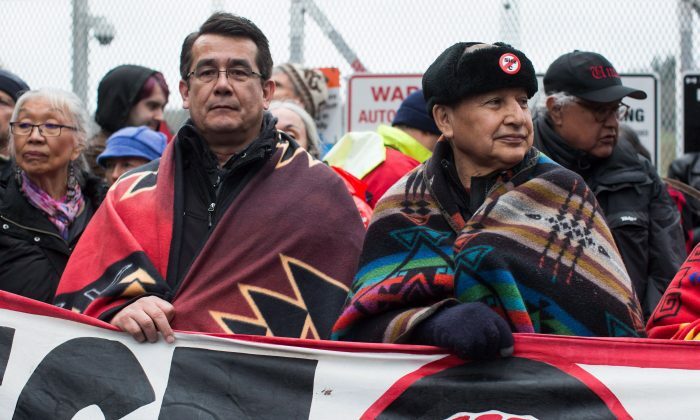 After Kinder Morgan threatened last month to pull out by May 31 if delays continue, Simpcw issued a statement in an effort to change the narrative that all First Nations are against the pipeline and to voice their frustration with Premier John Horgan and the B.C. government for not hearing their side. “If [the provincial and federal governments] are going to recognize Indigenous people’s rights to self-determination and self-governance and recognize our rights and titles over our traditional territories and be able to make decisions about those things, then there really is an obligation for them, I think, to include us in the discussion,” Matthew said. Matthew noted that it’s not like his band hasn’t considered environmental issues such as oil spills and other factors, including protecting their cultural heritage and traditional lands and mitigating potential damage. The gain would be jobs and training for band members, new infrastructure, and other economic benefits. All of these components were carefully negotiated with Kinder Morgan in 2015, he said, over a two-year process that included an extensive environmental assessment. And the benefits agreement offered to his people was put to a referendum, which resulted with 78 percent in favour. “It’s a very complex issue to deal with but as First Nations we have the responsibility if we are going to be stewards and caretakers of our territories. We have to become informed to make decisions,” he said. Matthew said a financial payment is also a key part of the deal, but Kinder Morgan has a clause that keeps mutual benefit agreements with First Nations confidential, so he couldn’t disclose the details. A total of 133 First Nations were approached by Kinder Morgan in B.C. and Alberta in compliance with a legal duty to consult before going ahead with resource projects. Critics point to the fact that only 43 have signed deals, signifying a majority of First Nations oppose the pipeline. However, the company wasn’t seeking an agreement with all 133, as some are well beyond the route of the pipeline and the route of all future tanker traffic. Kinder Morgan wasn’t able to gain the support of B.C.’s largest Indigenous groups, specifically the Lower Mainland nations of Squamish and Tsleil-Waututh, who are now actively leading the charge against the pipeline. Matthew said he respects all First Nations and where they stand, but no other nation but Simpcw can speak on their behalf. In the last few months several other First Nations have come out in support of Trans Mountain, most notably the Cheam First Nation. First Nations that are in support of other resource development projects have been raising their voices against opposition movements, as a number of significant projects have died leading to a loss in economic opportunities for Indigenous groups. Earlier this year, a report authorized by the First Nations LNG Alliance with the B.C. government found that not only do a large number of First Peoples support liquified natural gas projects, but many are disappointed that projects have been halted. “Either we stay with the status quo and say no to these projects or we look at them as an opportunity and find ways for our First Nations to say yes to these projects and do them in a responsible and balanced manner,” said Karen Ogen-Toews, CEO of the First Nations LNG Alliance. Ogen-Toews, a former chief with Wet’suwet‘en in northern B.C., has a background in social work and said she has seen poverty and despair plague her people and other First Nations, and for her it’s a “no-brainer” that resource development will open doors to new opportunities to help increase the standard of living for First Nations. Her job, she said, is to help educate and spread awareness about opportunities with liquefied natural gas in B.C., not just for Aboriginal groups but for the whole province and country. She added it’s time for Canada to stop playing the role of “little sister” to the United States—where almost all of Canada’s oil and gas that is exported ends up at below market value—and start selling to international markets where higher prices and profits can be reaped. Joe Dion, chief executive of First Nations-owned Frog Lake Energy Resources Corp. (FLERC) in Alberta, couldn’t agree more. “The U.S. is eating our lunch and buying our oil for cheap and we shouldn’t tolerate that. We need to get our act together in our country and that includes working with everybody, including First Nations,” he said. FLERC, which produces 2,000 barrels of oil per day on its traditional territory, providing housing and key infrastructure upgrades, is a First Nation success story when it comes to resource development and will be a model for others looking to find economic stability, Dion noted. “First Nations are finally getting their day in the sun. Getting a piece of the action is really where we have to go,” he said. Jared Gnam is a freelance reporter based in Vancouver. He broke into the world of journalism covering the Stanley Cup Riot in 2011.